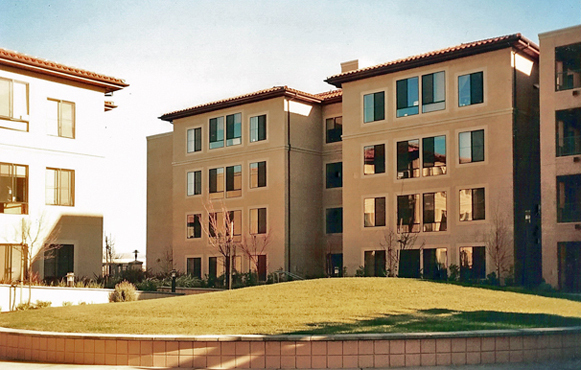 A student residence of 65 apartment units in two buildings sits proud on campus. Trellises at the entrance announce arrival into a double height lobby that leads to a multipurpose hall, student commons, technology and seminar rooms clustered on the first floor. Construction is Type V one hour with two hour area separation walls. A post tensioned concrete slab forms the landscaped podium with parking garage below. A typical 1054 sq ft student apartment has 2 bathrooms, kitchen-dining, living and 4 bedrooms to accommodate 4 students each. All units on all floors are accessible since elevators service each floor, located adjacent to the neighborhood commons and laundry. Elevator cores in both buildings form towers rising above the red clay tile roofs. At FFA, Sandhya led a team of three designers, prepared permit and construction documents and responded to RFI's during construction.